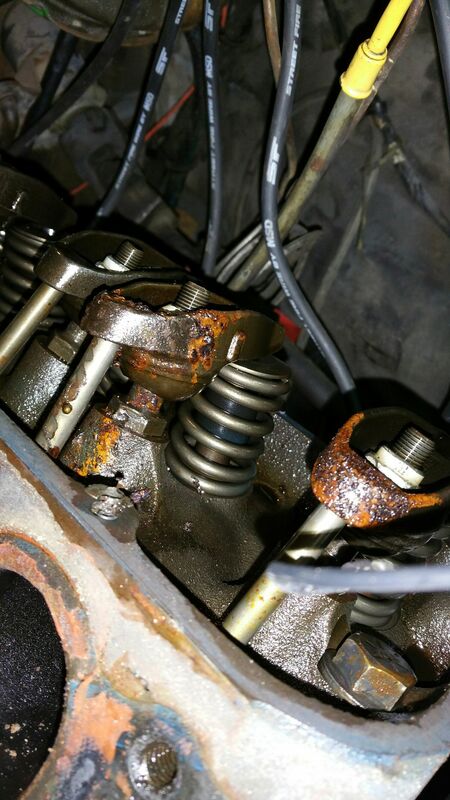 This is an old picture, I cleaned all the rust out a while back. Question are these adjustable or are the type you just torque to 20ft lb. Those look like adjustable rockers to me. The non adjustable is the same rocker but the stud is a "bottle neck" style with a smaller nut that bottoms against the shoulder of the stud. Are your studs straight with a 7/16 nut or are they 7/16 at the bottom and smaller at the top? Here is another angle. I am going to pull the covers off again today. I am getting a little noise on my passenger side and wanted to check them. DaveMcLain wrote: Those look like adjustable rockers to me. The non adjustable is the same rocker but the stud is a "bottle neck" style with a smaller nut that bottoms against the shoulder of the stud. Are your studs straight with a 7/16 nut or are they 7/16 at the bottom and smaller at the top? Looks like limited adjustability to me; maybe simply to adjust for correct hydraulic lifter preload as those are "rail rockers" with no guideplates. So tell me what I need to do to 100% verify one way or the other what type these are? Remove the rockerarm and show us what the stud looks like....like Dave said....it's more about the stud style than the rocker. They are rail rockers for hydraulic cams they are not truly an adjustable rocker. There has been 3-4 different answers in just this one thread. I will pull a rocker off this after noon and post pictures of the rocker and stud. OK here are the pictures. If I need another picture from a different angle let me know. I really appreciate everyone's input. 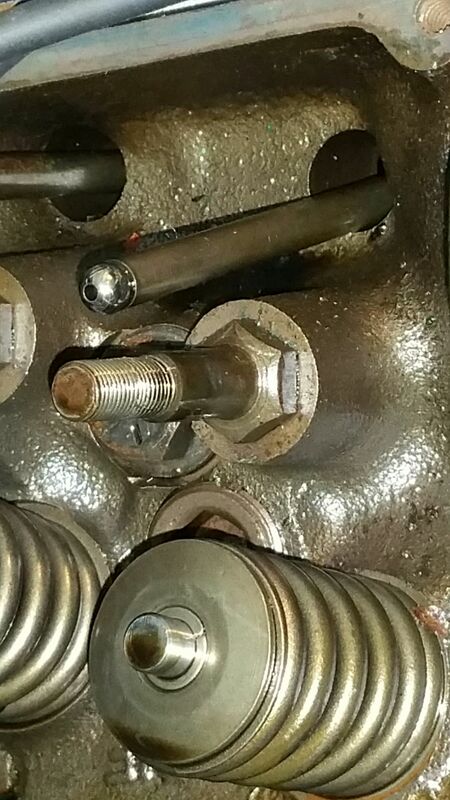 It's a positive stop non adjustable stud. You might want to soak that rust with some naval jelly or other type of rust inhibitor so it does not grow back also. supervel45 wrote: It's a positive stop non adjustable stud. You might want to soak that rust with some naval jelly or other type of rust inhibitor so it does not grow back also. So I can set them all to 20ft lb and walk away? Depends. Is everything else stock? I assume you mean the spring and lifters. I have no way of knowing that I can guess it was rebuilt at some time as the parts don't look like I would suspect them to if they were 45 years old. Why don't you check and see how much lifter pre-load you have with the rocker bolted all the way to the stop, IE count the amount the nut turns past .00" lash? supervel45 wrote: Why don't you check and see how much lifter pre-load you have with the rocker bolted all the way to the stop, IE count the amount the nut turns past .00" lash? You just started talking greek to me. I am a novice when it has to do with Valve train work. Don't take that statement for being stupid but I googled and it seems every single person that has ever written and article tells you a different way to accomplish that task. Turn the engine so that the lifter you are working on is all the way down on the bottom of the cam lobe. Adjust the rocker until there is 0 vertical movement in the pushrod. Mark the adjusting nut. Then turn it to the stop and torque. Note how much it turned. 1/4 to 3/4 turn of the nut is usually the recommended lifter preload. If the block has been decked, the heads milled, or both, you will have more preload then stock. Guys have been known to double nut the rockers with them backed off the studs shoulder to set the preload to their liking if is too tight. For a street car, torque to shoulder........ eh probably fine. 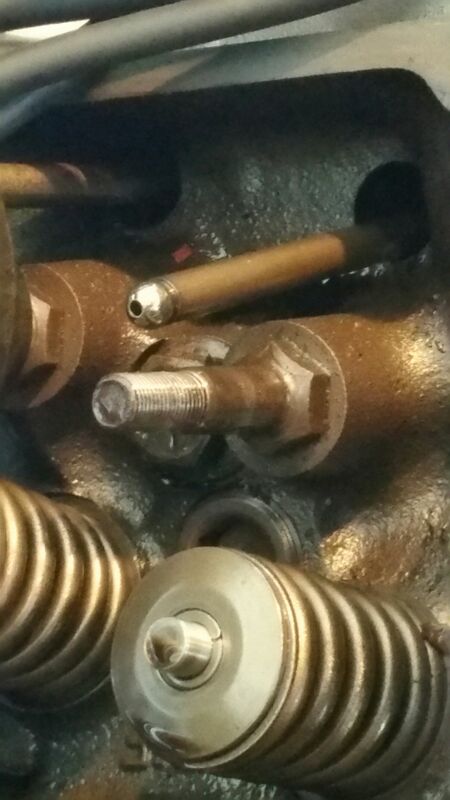 For anything else, best bet, pull studs, get new rockers, and then enjoy the fun of an adjustable valve train. supervel45 wrote: Turn the engine so that the lifter you are working on is all the way down on the bottom of the cam lobe. Adjust the rocker until there is 0 vertical movement in the pushrod. Mark the adjusting nut. Then turn it to the stop and torque. Note how much it turned. 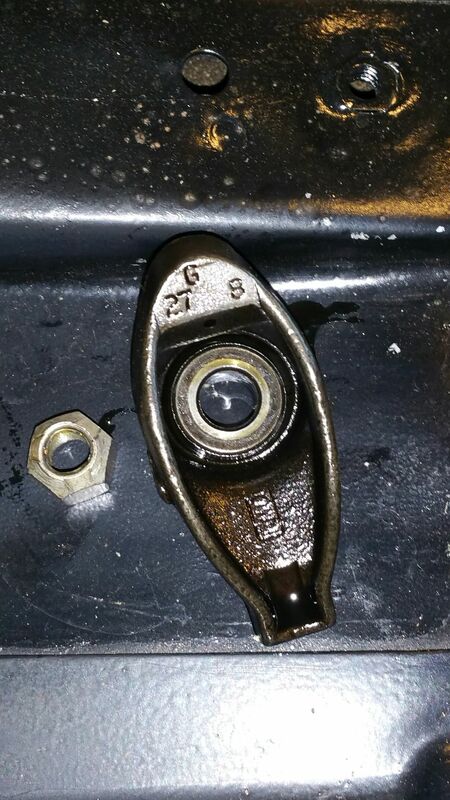 1/4 to 3/4 turn of the nut is usually the recommended lifter preload. If the block has been decked, the heads milled, or both, you will have more preload then stock. Guys have been known to double nut the rockers with them backed off the studs shoulder to set the preload to their liking if is too tight. Does it matter if the engine is cold or hot? I ordered some of these from Oreilly these were the only ones they had for this engine. They are an exact match of the ones that are in there. This was the factory replacement size, so can I assume based on them matching up if it was rebuilt it was put back factory? I cant tell you how much I appreciate some of you taking the time to help, many forums would just flame people for not knowing. You can do it cold with a hydraulic cam. The hot cold deal is for mechanical cam deals and the measurement only changes around .005"-.006" on the lash. You did not say if the rockers were torqued down to the stop before you removed them, did you check? http://www.compcams.com/catalog/COMP2012/pdf/COMP_Catalog_2012_292-311.pdf On page 297 you can see Comp Cams lists their High Energy pushrods for 72-87 engines at 8.550" and has two alternate sizes shorter and longer. Ford also changed the deck height 3 times from 10.3" to 10.322" over the years, so be careful and check them closely. When the cam is ground "larger" with more lift the lifter still stops at the same place at maximum lift but the base circle is reduced so the starting point of the lifter is lower. 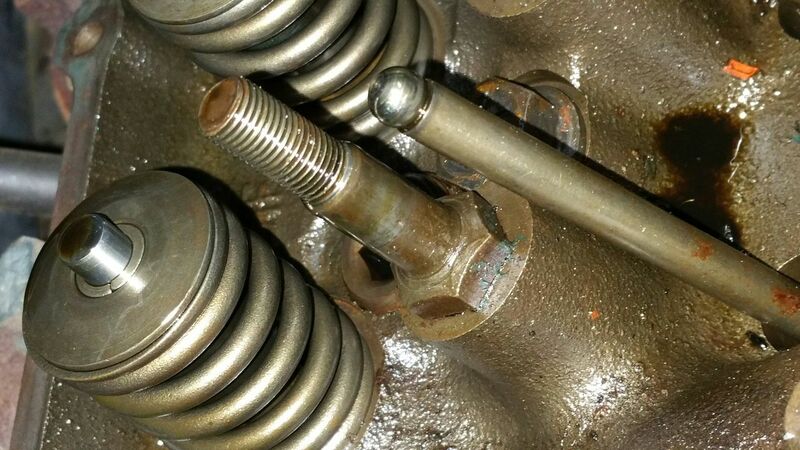 This is why longer pushrods might be required if the lobe lift is greatly increased. With that said the amount of lifter compression in the stock engine is generally enough to allow quite a bit of change to be made without having to swap parts even with a non adjustable valve train. .020 change in deck height from year to year just isn't going to make a significant difference with a hydraulic cam. supervel45 wrote: You can do it cold with a hydraulic cam. The hot cold deal is for mechanical cam deals and the measurement only changes around .005"-.006" on the lash. You did not say if the rockers were torqued down to the stop before you removed them, did you check? I did not check. I will check this afternoon when I get back out to work on it. 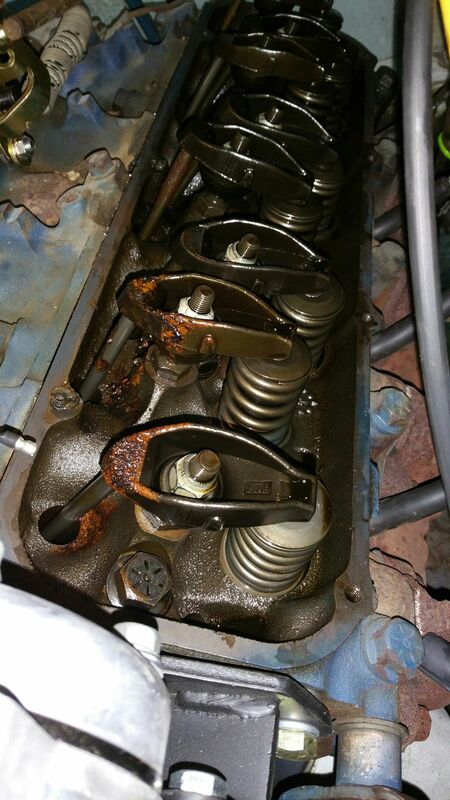 This is a 1970 block and heads. Stuff like this is going to get you into trouble. It doesn't matter what year it is. Once you change one parameter from stock then you need to check everything. If you don't know what has been changed then you need to change everything. Lots of times people just throw it together and it works even though there maybe a bunch of problems, they just get lucky. Because valve train geometry is based on multiple components bolted together a few small errors here and there can compound to a big error. Examples would be if the block was ever machined, if the head was ever machined, maybe the head gaskets are different thickness than original, if the heads were ever were rebuilt maybe the valves are longer or shorter, maybe the valves are deeper or shallower in the head. If you change the cam maybe the cam is larger (as mentioned). That is why you need to check everything. Don't sweat it though because everyone has to learn. IIRC my first cam swap I just bolted it on like you asked and it worked fine up until I changed heads. A cheap alternative is to just change the stud to an adjustable one ( the threads are just longer) and use a stamped steel BBC rocker. The ratio is a smidge less but it will work fine if the budget is a concern.